A shelter opposite by Kaş Municipality building, managed by local administration, has mooring capacity up to 20 visiting boats. The depth in the inlet is 5 – 8 m. There are a few laid mooring lines where you can pick up. A Coast Guard vessel berths on the inner quay Water and electricity connections are provided. Bilge discharge and laundry services are available within the shelter. Fuel is obtained from a tanker truck. All sort of provisions are available from the markets. Bank ATMs, cargo companies’ offices, pharmacies and State Clinic are within the town. 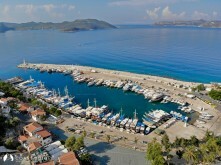 There is limited availability of yachting equipment or spares in Kaş. There are two chandleries in the town. The public market takes place on Fridays, at which you can find most provisions. Regular transportation services are available to Kemer – 29 km, Antalya – 185km and Dalaman International Airport – 150km. Kaş is a unique town to explore. Hotels, bars and several restaurants are located near to shelter. Kaş is a booming center for diving. Scuba diving courses are available. There are nearly 30 colorful diving spots in the region. Diving courses are regularly organized; nearly 15 diving schools are arranging courses in summer and winter. Kaş is also very attractive spot for Para-gliders. The facilities are well maintained. Canoe activity is becoming popular in Kaş, tours are organized for visitors. 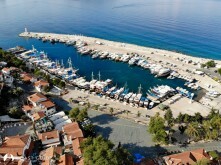 Excursion boats between Kaş and Meis Island (3 NM) are always available.